It was a pleasure to hear from Scottie Elliott, son of ex QoS forward of the early 60s, Maurice Elliott. A local boy born on 23rd November 1942, Elliott played for Dumfries Academy, Collin Boys F.C. and Royal Douglas Amateurs before signing pro terms for Queens at the age of 18 in the Summer of 1960. Jimmy McKinnell junior was Queens manager at the time. Elliott’s goals included 16 in 23 league games as well helping Queens to a League Cup semi final appearance. After only seven months he was signed on 1st March 1961 by the reigning Scottish League Champions, Hearts. He debuted for Hearts on the 18th of that month in a 1-0 home defeat by Kilmarnock. Elliott scored in a 2-1 home win against Celtic on 21st October 1961. The other Hearts scorer was the man who ultimately replaced Bauld, Willie Wallace, who later won the 1967 European Cup with Celtic. As well as this Elliott also played in a 1-1 draw against Rangers in the 1961 Scottish League Cup Final lining up again beside Wallace. Neither Elliott nor Wallace played in the League Cup Final replay but Bauld did. Rangers won 3-1 with three future QoS managers in their line up; Bobby Shearer, Harold Davis and Davie Wilson. Both games were played at Hampden. Despite these laudable achievements Elliot was unable to secure first team football at Hearts notching three goals from his 17 first team games. He never played for the Hearts first team after the end of the 61/62 season. George Farm signed him to return to Queens on New Year’s Day 1964 but in the league Elliott played only five games in this short spell at Queens. He then spent the next two seasons at Montrose (25 goals from 50 league games) and then two also at Stenhousemuir (16 goals from 57 league games). Elliott then departed from the senior game by joining Broxburn. He eventually stopped playing due to recurrence of injury. 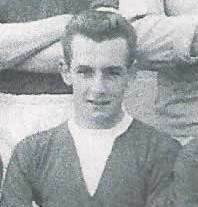 As an appendage to the above published feature, a regular contrubutor to articles for qosfc.com, Bruce Wright, commented that he was a team mate of Maurice Elliott in the Dumfries Academy intermediary school team. Another team mate in this side that won the Dumfries and Galloway Schools league and cup double was future QoS chairman, Norman Blount.